snowdeal.org > ex machina: 70 years ago, thousands would gather to watch human huskers "bang" 50 ears a minute. 70 years ago, thousands would gather to watch human huskers "bang" 50 ears a minute. for most of human history, until the 1930s, corn was harvested and stored by the ear by humans. 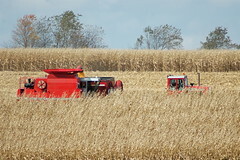 of course, today, machines harvest corn by the kernel and there's not much demand for cornhuskers who could draw crowds by picking two or three rows simultaneously.